KGR Industriesare a leading global manufacturer and exporter of rock drilling tools and equipment, service and advanced technical solutions for the mining in industry.The world's most comprehensive and productive range of rock drilling tools and hammers and button bits are available at affordable prices. A Rock Drilling is a machine or a device, specially designed to drill through rocks.Used for certain activities such as digging wells, preparing foundations, and mineral exploration. 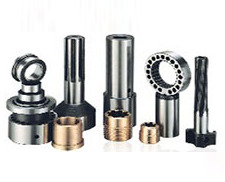 A number of organizations manufacture the rock drilling tools, often offering a lineup of several models to meet specific requirements and needs.When using a wide selection of rock drilling tools, you need to know about the tools you are using are reliable.Rock Drilling Tools for Mining in India has experienced professionals for designing and developing a high-quality rock tools and offer an extensive range to cover all of your needs and requirements as per the industry standards.